Virtuosic, original and exciting, Malumba’s genre-defying music will take you on a sonic journey while making your toes tap and your heart soar. 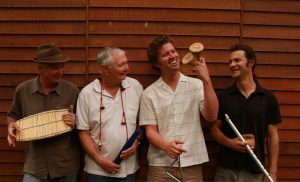 With hints of Klezmer melodies, gypsy jazz harmonies, Celtic instruments and African rhythms, Malumba’s sound are unique and hugely versatile. Blending together the sounds of Australia’s top folk and jazz musicians ensures performances are exciting and full of improvisation. Another locally-based festival favourite.